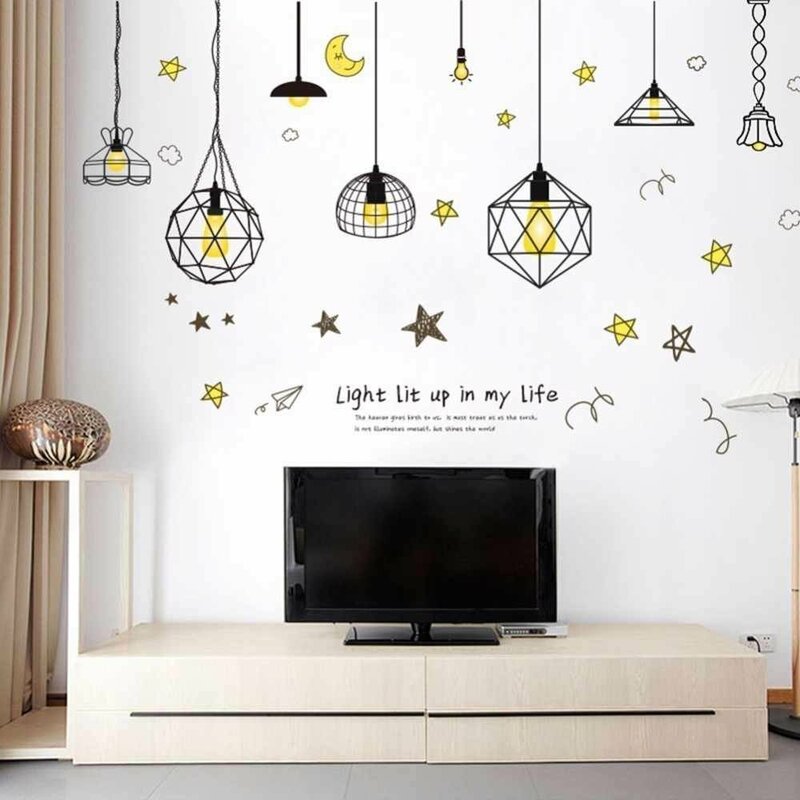 Electrical wires, cords, cables coming from different appliances to the outlet, can considerably spoil the appearance of the room become an easy target for young children, “sharp-toothed” animals. When many electrical appliances, the question arises: how to hide the wires, so they didn’t show or they were minimally visible. Methods are many, most of them are easy to translate into reality their own hands. 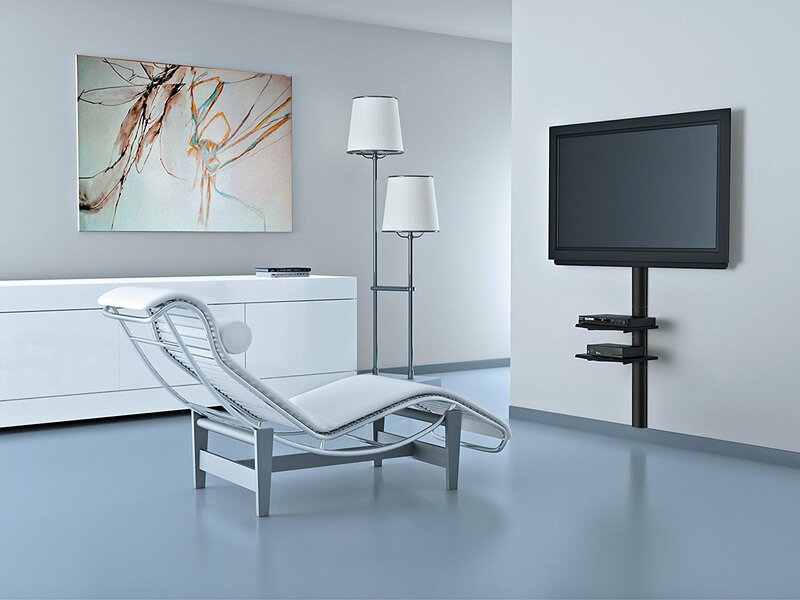 it is unsafe for a cable stretched across the room, easy to catch, fall, get hurt. A child who is teething, many Pets, able of curiosity to chew on electrical wires, which often leads to electrical shock of varying severity. 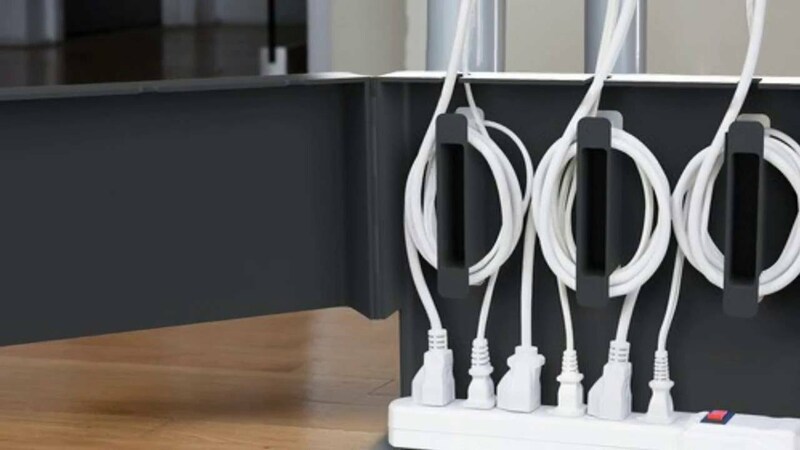 Besides the cords, it is desirable to hide the “box” extensions, along with many of them sticking out of chargers from the gadgets. 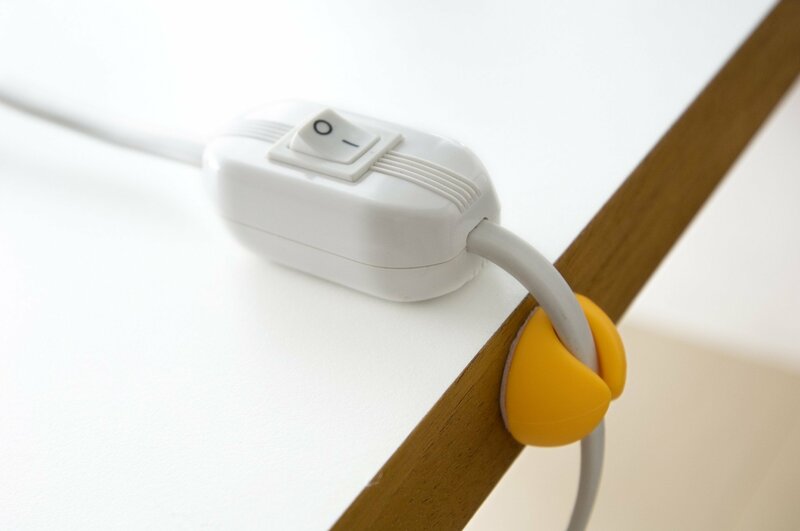 The most popular option when hiding the cable directly into the wall – the so-called “hidden wiring”. For this it is cut corresponding notches where you put the electricity cables obscure recesses. It turns out dusty, long enough, but if work is done well, the dangerous items are securely hidden to see it, and even more so to damage them, without compromising the integrity of the wall will fail. For a start is a scheme transaction, the markup is produced by a construction or a laser method. To do grooves, take the hammer, grinders or wall chasers. Against brick, concrete wall details are attached dowels, clamps. 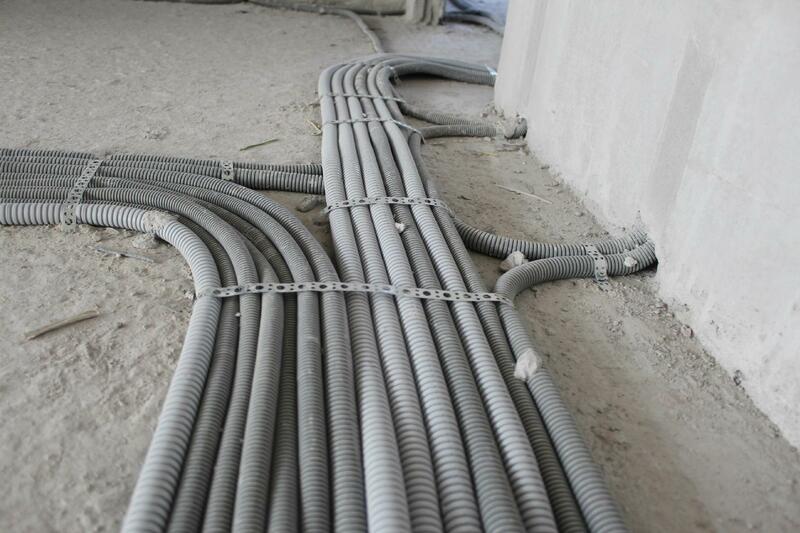 After the cable is laid, the grooves are ground, cover with a plaster, the wall leveled. The wiring under the drywall is much easier than in the concrete. It is also necessary to lay the cable on a clear route to multiple screws have not damaged it. 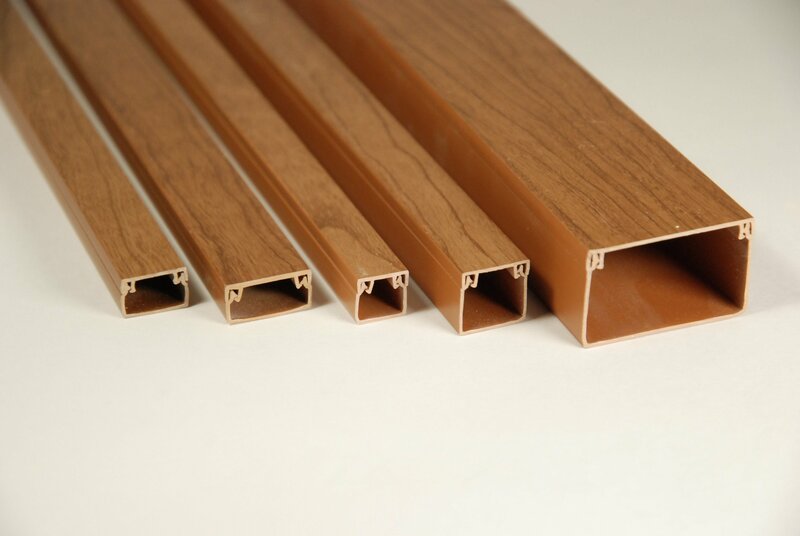 To start “going” frame of aluminum profiles, gypsum Board. 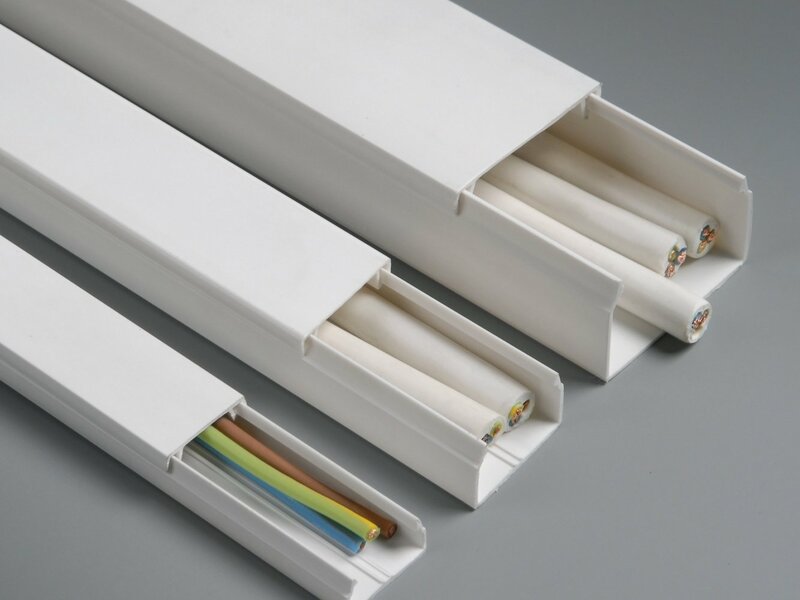 Lay the cord required in a special corrugated tube, which has a certificate of fire safety. 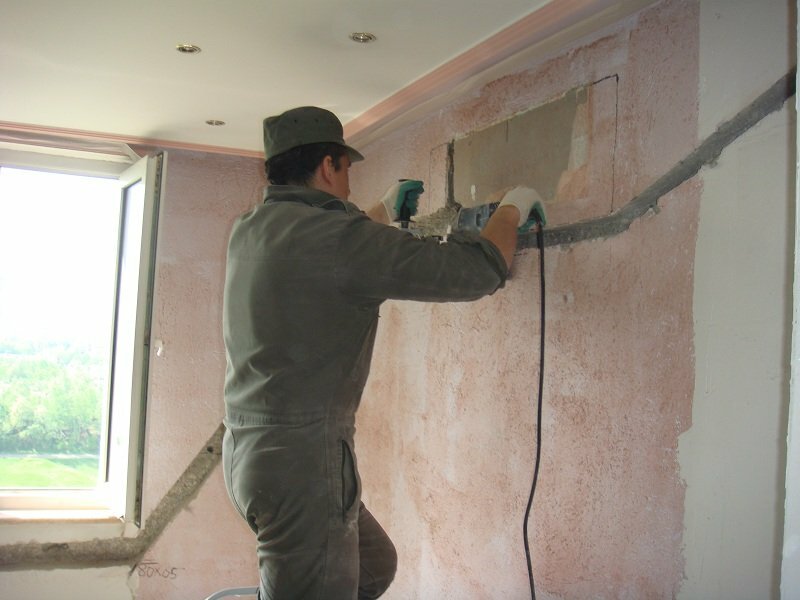 When a plaster wall is already available and it is necessary to lay a cable, then compiled the layout of electrical equipment. 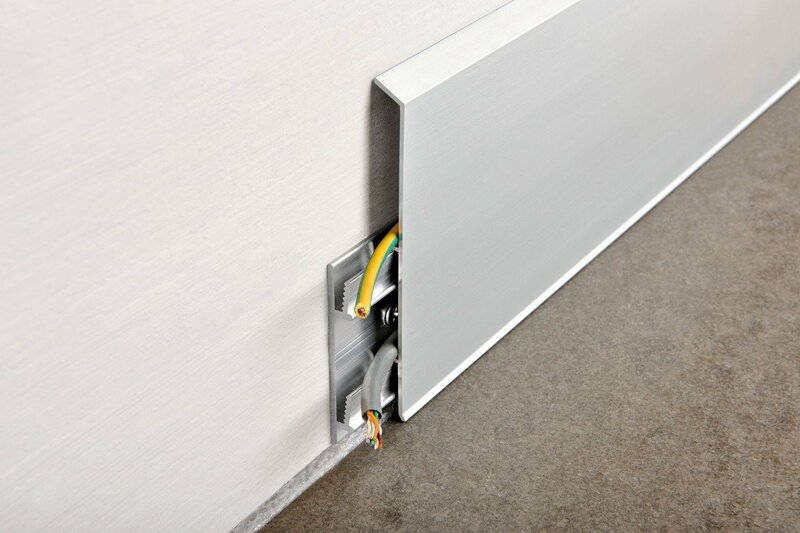 Cords here run horizontally, vertically, including through holes in the support metal drywall profiles. 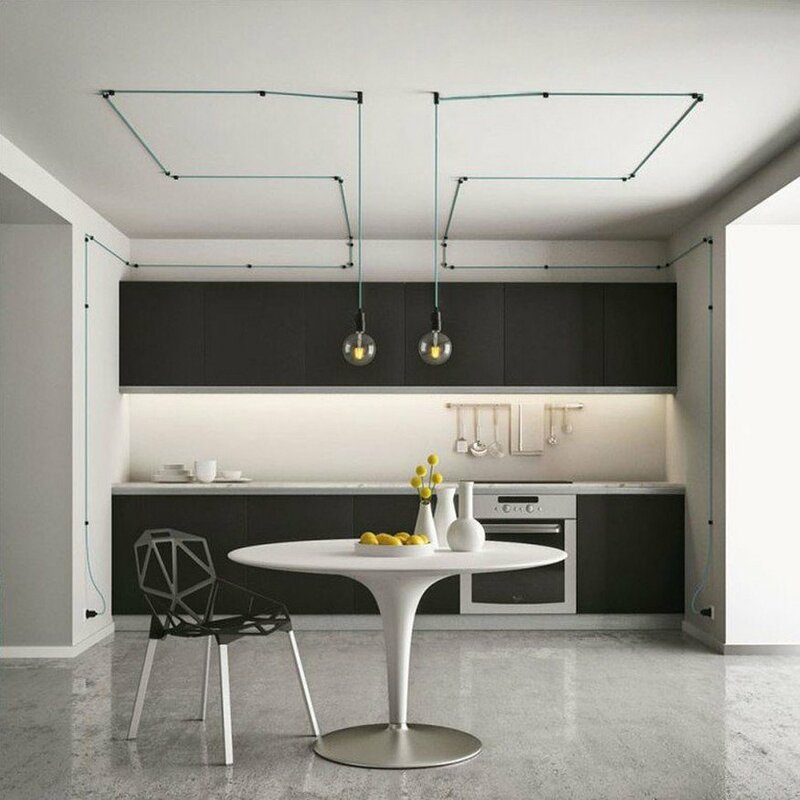 The placement of the wiring in the ceiling is convenient, if the latter is partially or completely made of drywall, stretch films, hollow wood, plastic false beams. Such coatings are well conceal all the cables, corrugated pipe, other communications. It is convenient in cases where the floors, the walls are almost ready, they are unique, artistic coverage to change anything problematic. On the floor the cables are allowed, if you do it on the ceiling, the walls impossible. 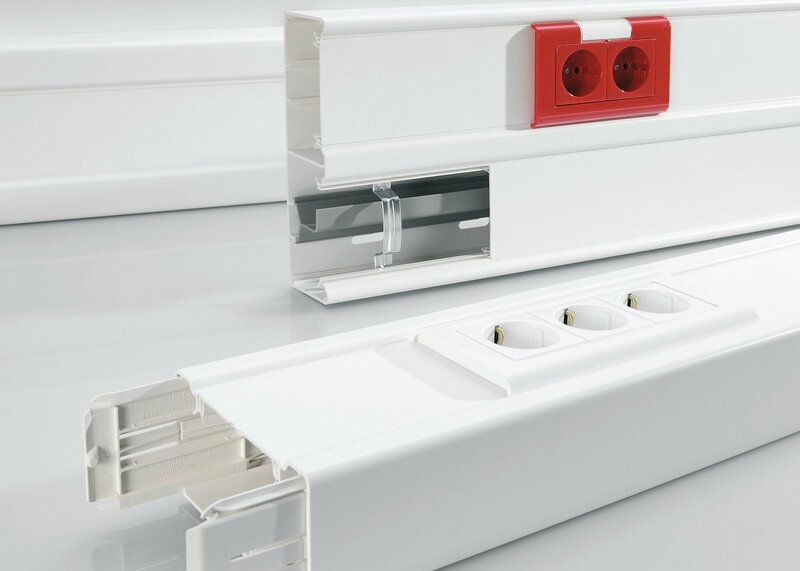 Then, the coupler is of a thickness of four to seven centimeters underneath all that easy to hide any number of wires. 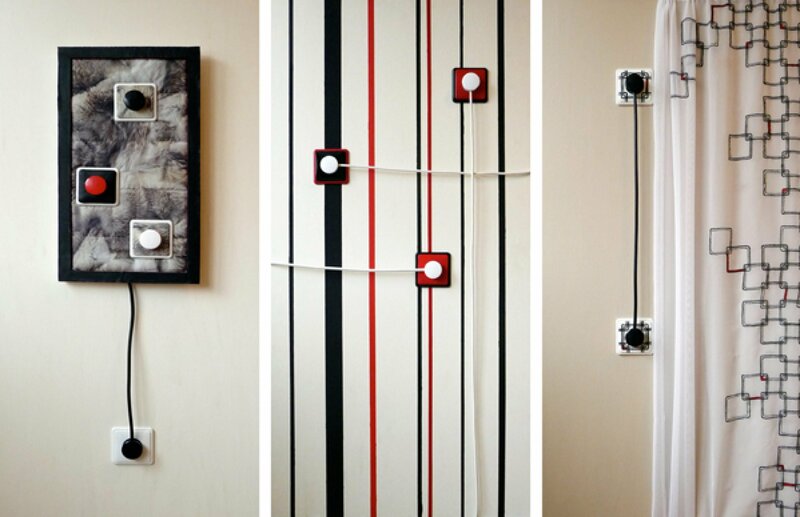 Another convenience factor is the placement of outlets, switches as close to the floor (30-90 cm). Stroebe wall for installation of enclosures here have quite a bit of saving cable also come out significant. 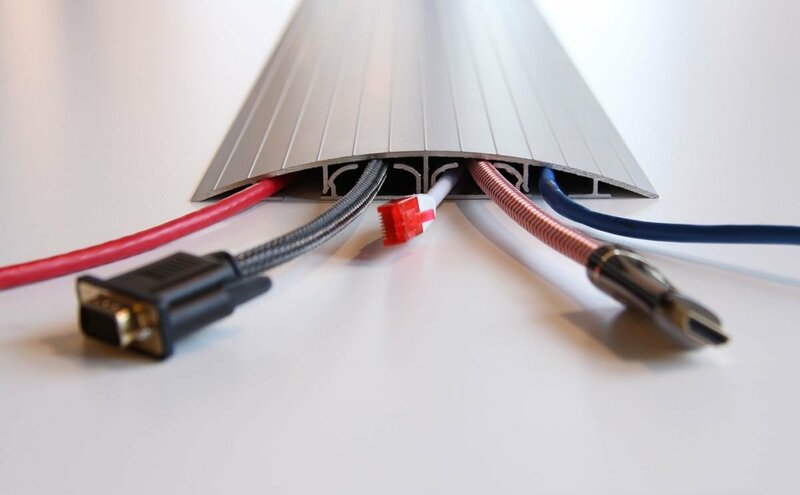 It is important to choose the most durable, heavy corrugation under each cord, and most of the wiring to be mounted at a distance of 20-30 cm from the wall. 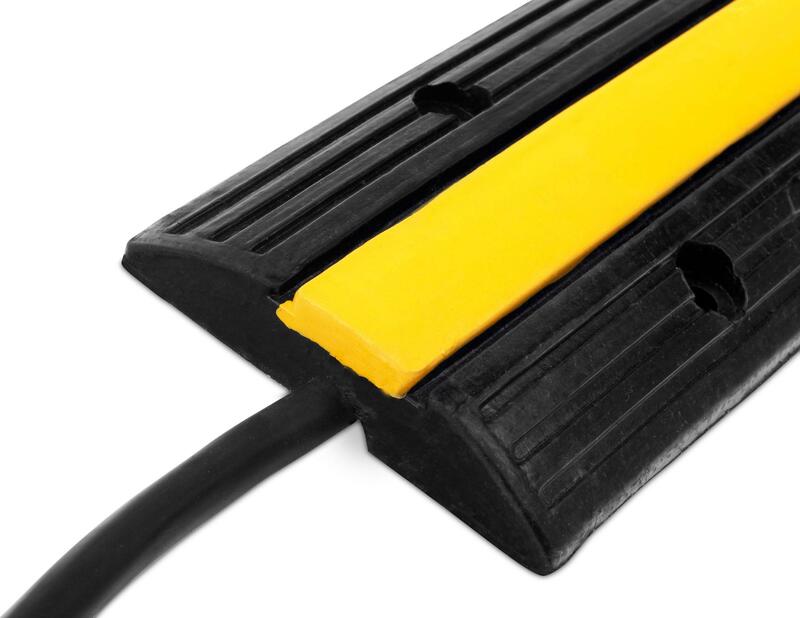 Floor anchoring is carried out by means of a flexible tape, textile material or on the net. item available in different colors matched to existing floor covering. 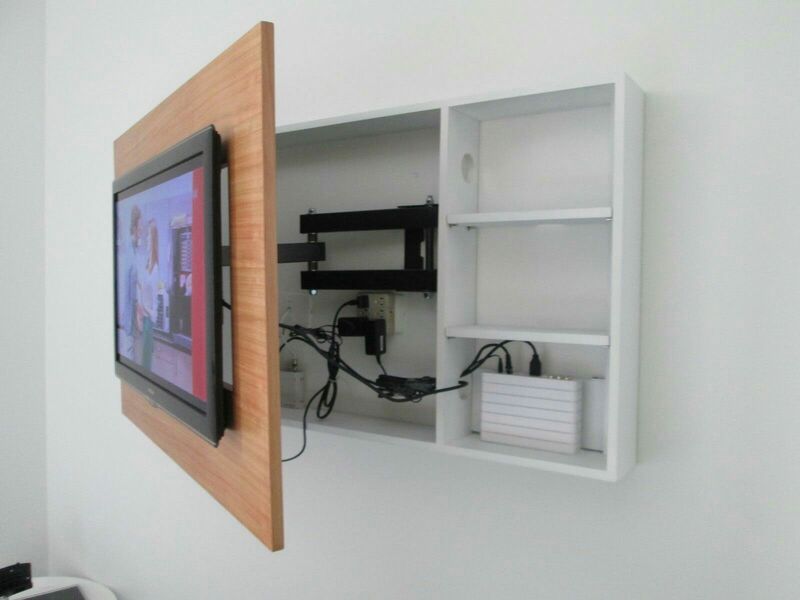 The cable channel is located inside the design center, or in a removable top half. 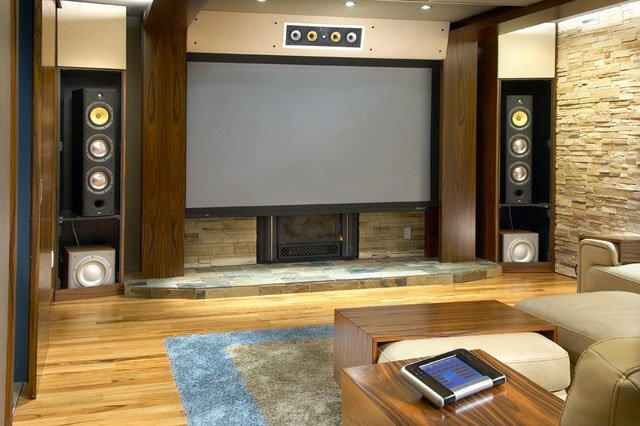 The first option is ideal when you need to hide three or four wires, the other for several thick cords. 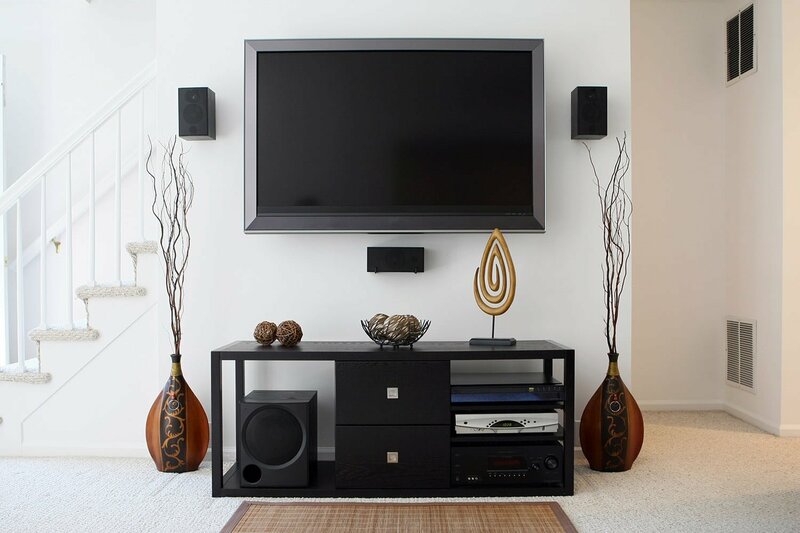 The plinth it is important to choose color, width, mount it from the inner corners of the room. All angles are covered with special decorative plates purchased with the plinths. For lumber, concrete, drywall walls here applies appropriate fasteners plinth should adjoin densely to a wall and the floor. 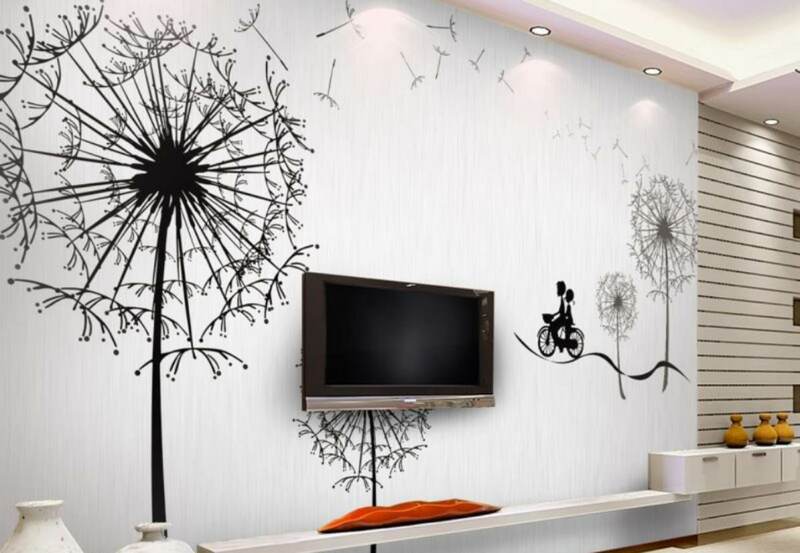 Plastic channels, where to invest, stick in the cord, called cable-TV. 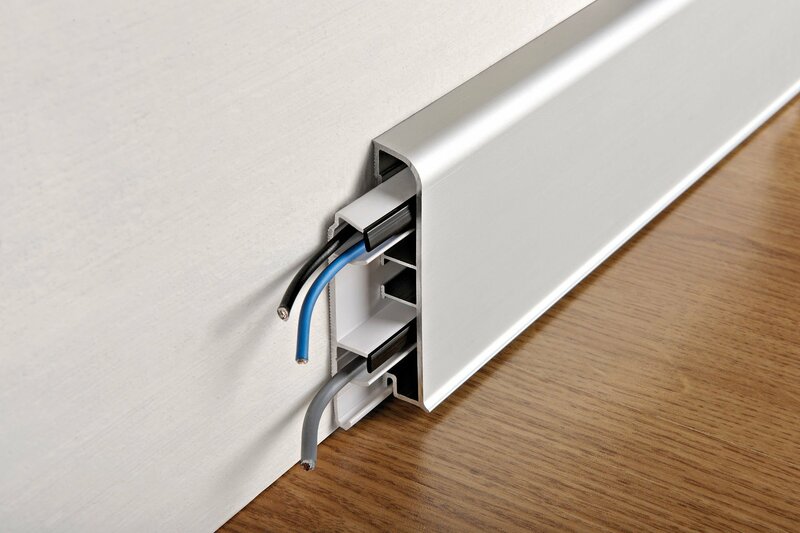 This is one of the most convenient options of hiding wires used after completion of the finishing works. They are often used in the kitchen is handy when a repair is made, but later acquired additional equipment type air conditioners, washing machines, lighting fixtures. Cable channels differ in color, they are easy to replace, to add new branches. The design is executed from fireproof materials, cords in it as much as possible protected from damage from the outside, the ultraviolet radiation. The downside here is that pick up the colors for some interior styles (Baroque, environmental, Empire, rustic, etc.) 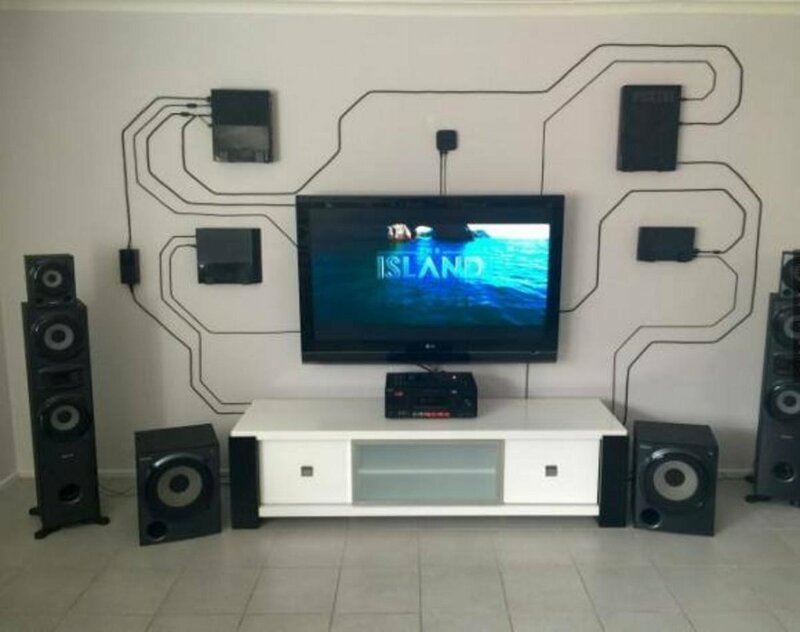 problematic, although the design looks much better than wires hanging everywhere. When the cable channel is located on the corner, every ledge, it is easy to catch. The element is made of plastic, metal (galvanized steel, anodized aluminum), it is U-shaped, W-shaped, triangular, semicircular cross section. 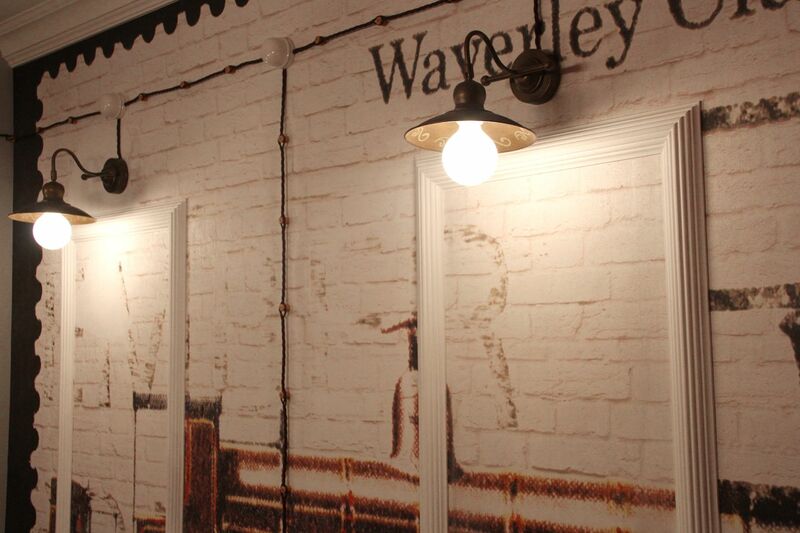 Mount to the wall, the floor is made with screws, dowels, nails, iron clamps, anchors. There are also flexible rubber, wire, transparent options. 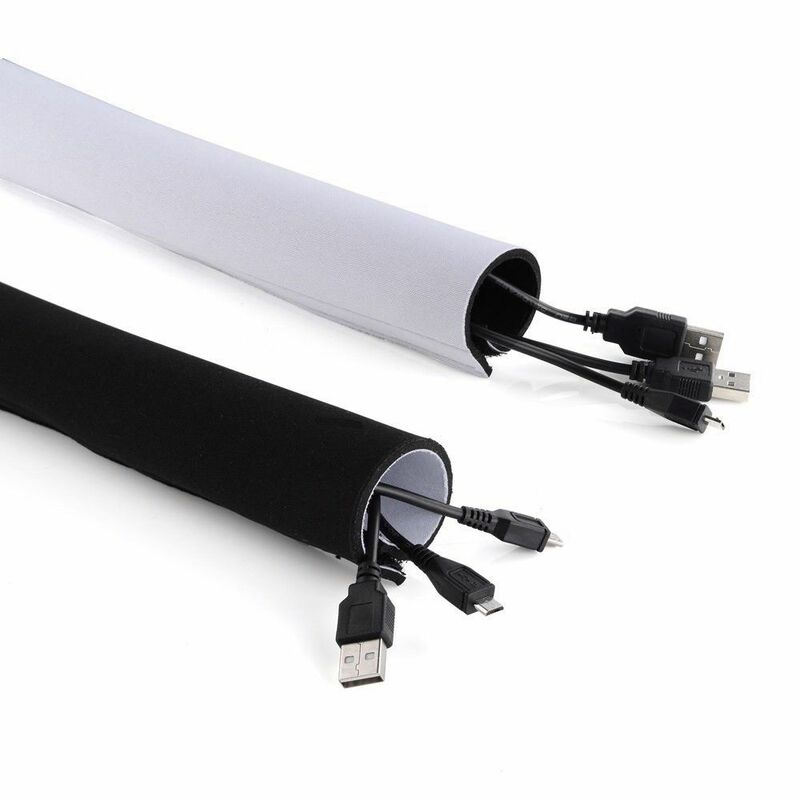 Fabricate cover for single, multiple cords simultaneously, we can cut into long, narrow strips of plastic bags. Of them with knitting needles or crochet fit a kind of “sleeve” that reach all the wiring needed. 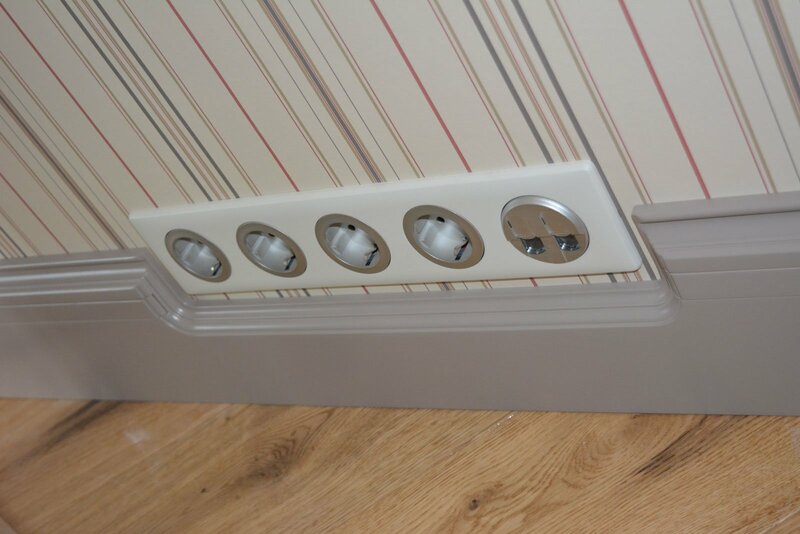 To hide so a power strip with chargers, fit or sewn bag of suitable size. Individual stores offer decorative collapsible covers of plastic, in the form of branches of trees, colored tubes, shiny snakes. This design has no protective properties as the cable channels, but to close it “ugly” wire is acceptable. 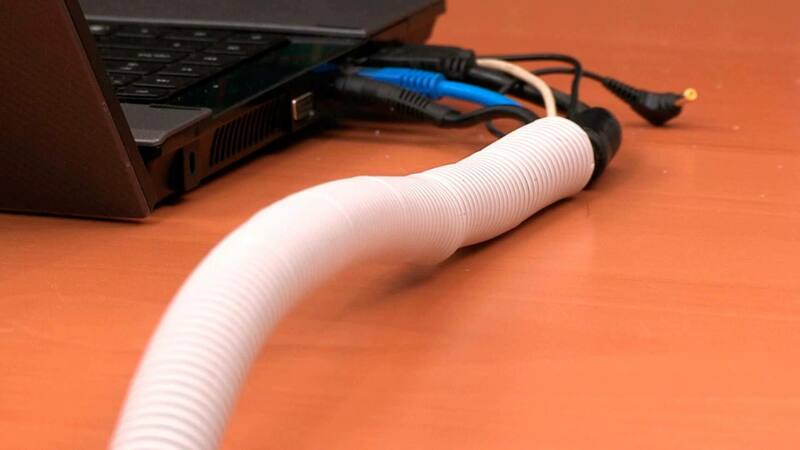 If you wish to purchase special spiral wrap – it’s flexible, has an aesthetic appearance, allows you to hide as a single item, and lots of wires. 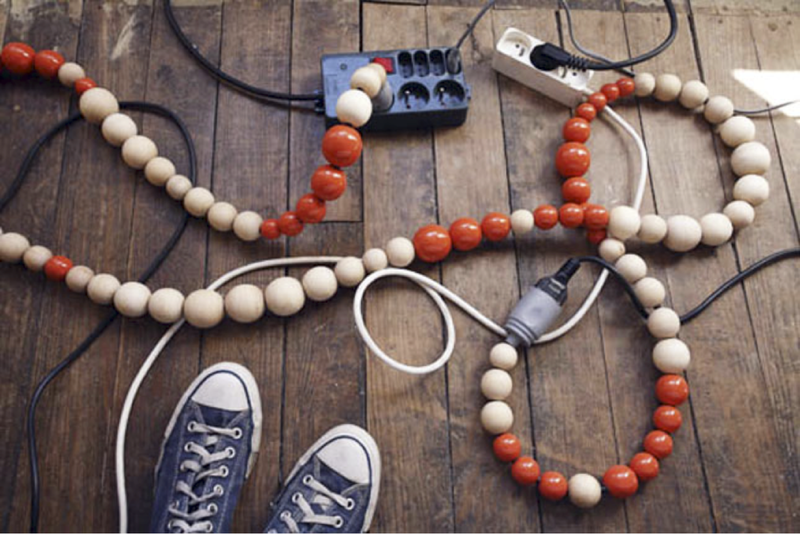 Decorative elements that help to hide or accurately consolidate numerous cords are sold almost everywhere, are quite inexpensive. 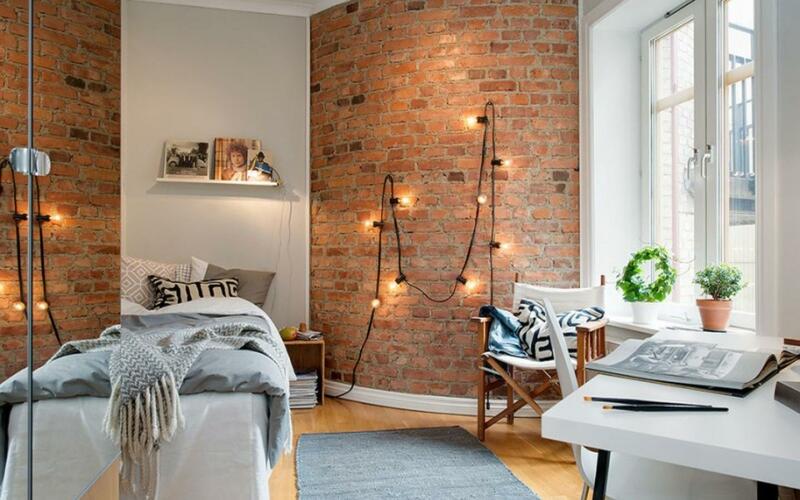 This way you can decorate the cord coming from the wall above the bed in the bedroom. Decorate the cable from the TV, the cord from the heater going on the floor, succeed with a “toy” mini-fence, glued to the baseboard. 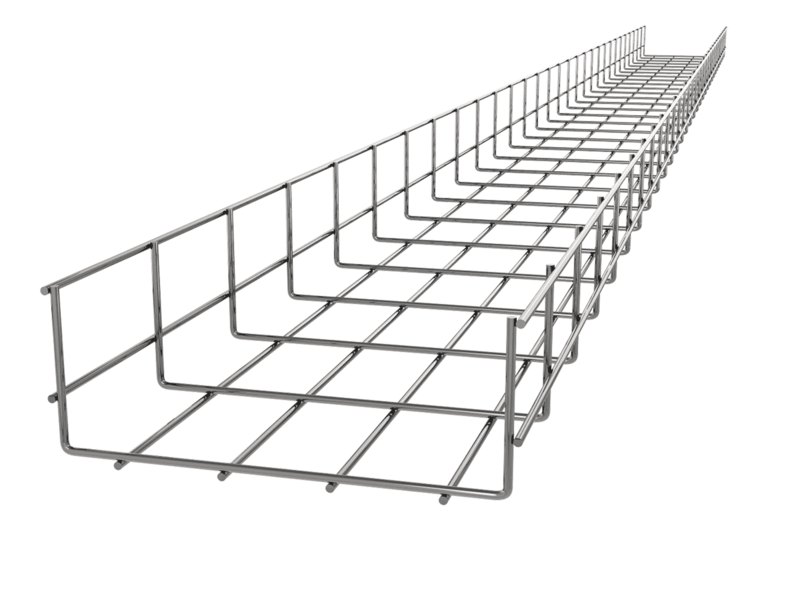 If the fence is planned to neatly hide a set of elements that are used the tie straps. Decorative collars are now sold in all electronics stores. They represent the adjustable Flex clip, decorated with leaves, flowers, butterflies, birds, houses. In the romantic interiors of the lace is adorned with sequins and feathers in the nursery – stickers depicting characters from fairy tales, favorite toon. 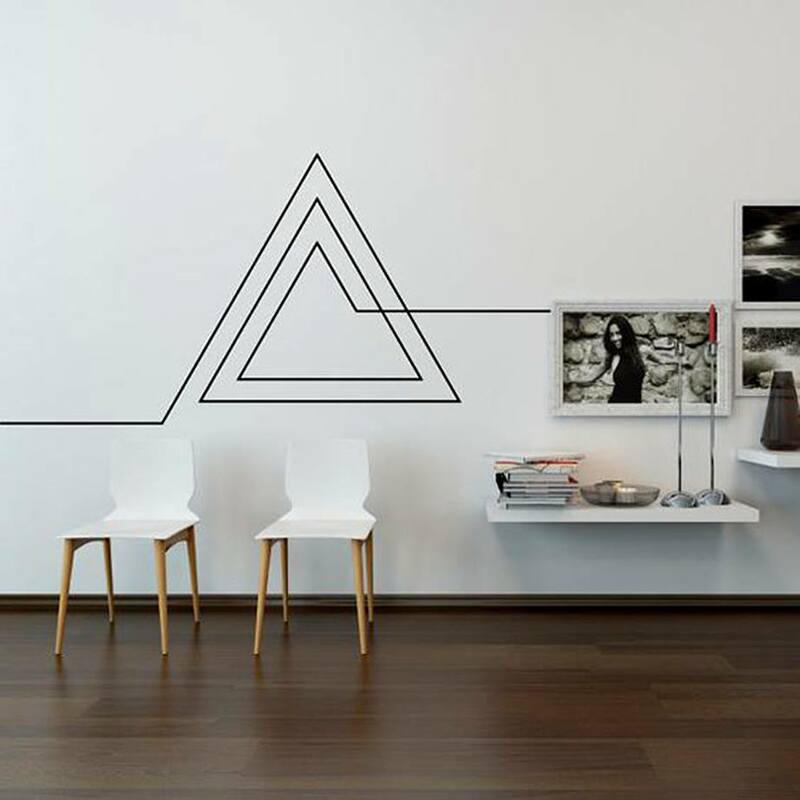 From a long cord, contrasting with the wall, near which it is located, it is easy to create original contour image. 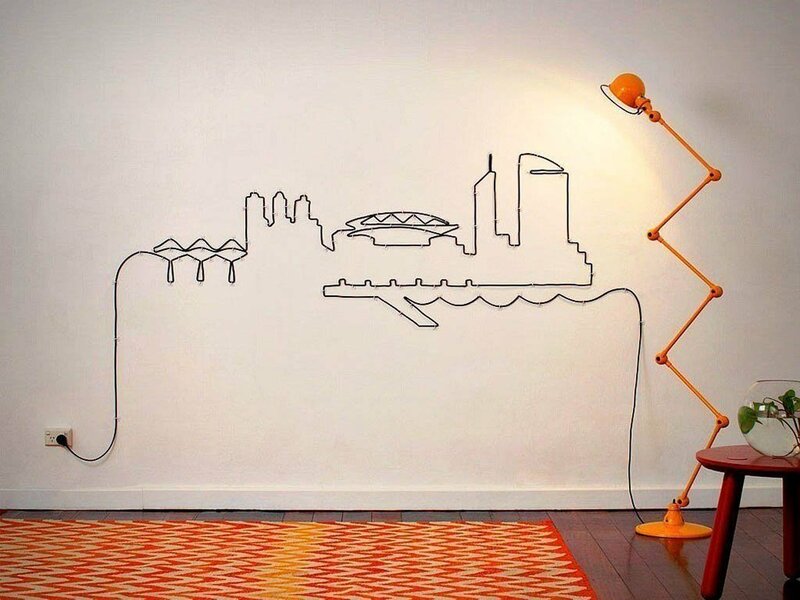 When the strings are long enough that there could be intentional, of them lay out geometric patterns, the whole narrative paintings – panoramas of cities, silhouettes of animals, people, trees, legs and backs of furniture, framed mirrors. 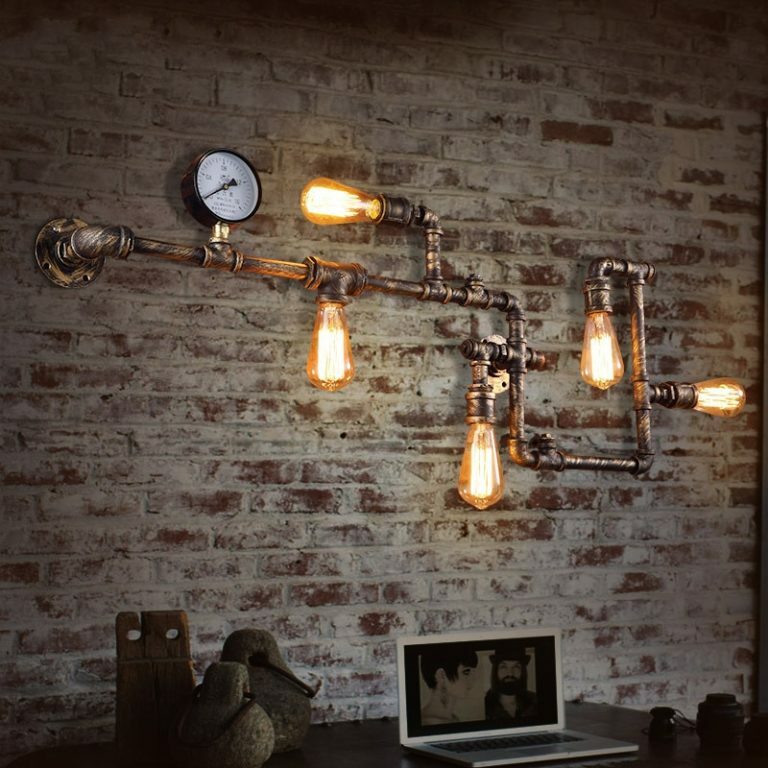 The interiors in the loft style are also easy to decorate wires, laying them bricks, having deliberately huge corrugated pipes covered with bronze paint. The latter is also within the intended form. Colored body wires of each type can become a continuation of the wall paintings, duplicating the pattern on the curtains, the floor, mimicking the “missing” parts of various designs. 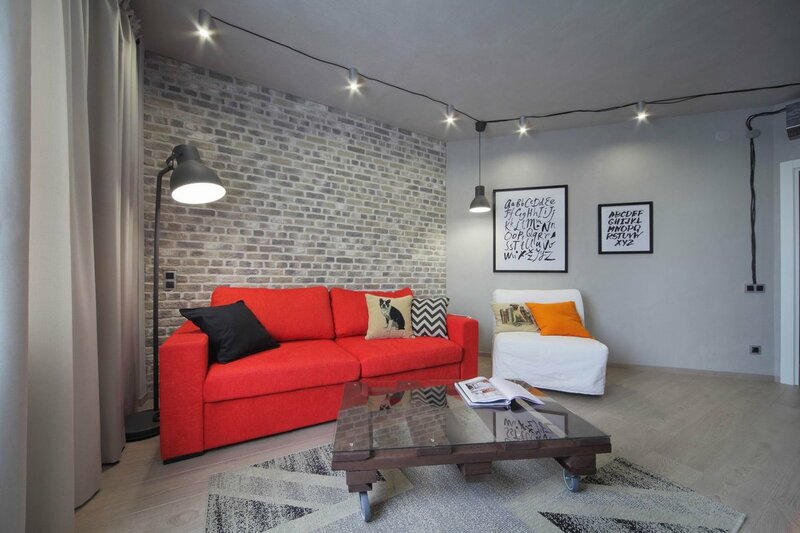 The loft is one of the few interior styles, which are not allowed to hide, but rather to strongly emphasize the presence of wires in different places. 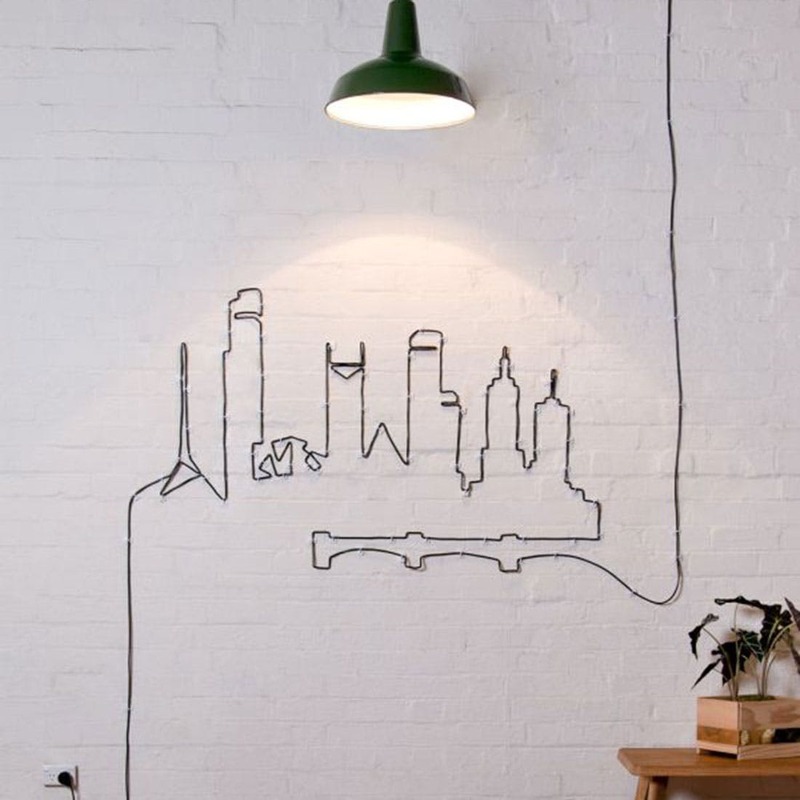 The original posting in the “retro” style, which not long ago were found only on really old houses, now offered by many firms who specialize in the electrical wiring. 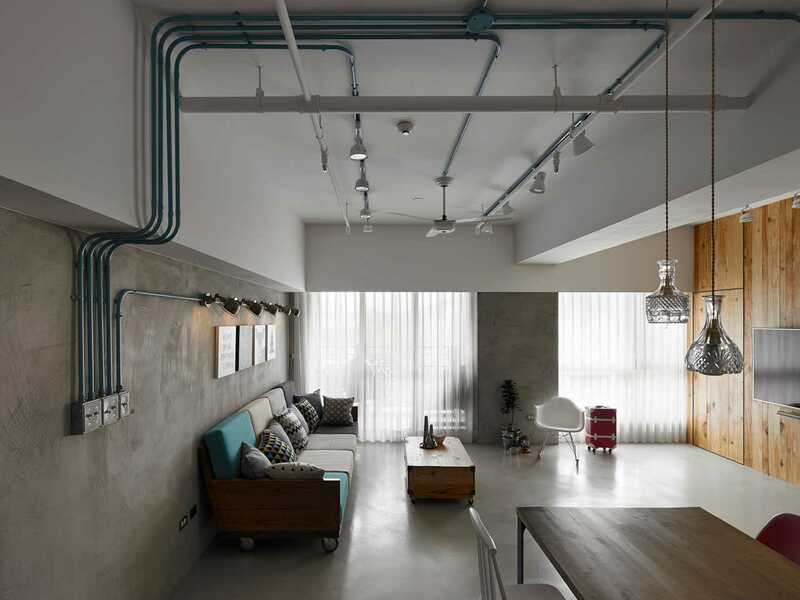 In the loft wires is not hiding, but security here has not been canceled – when there is the risk of accidental damage, the item better to hide in the massive cable TV stylized as copper, steel, corrugated pipes, wooden boxes and etc. 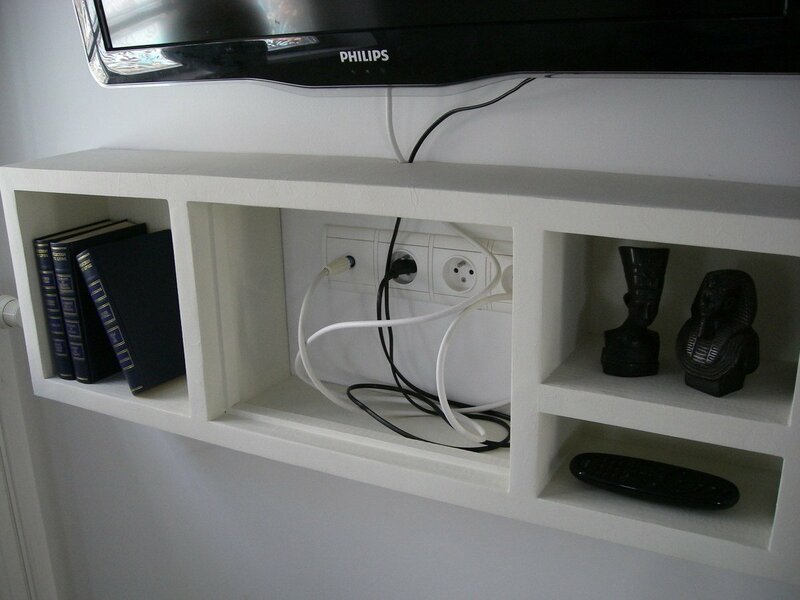 The cables and cords from your TV, set-top boxes, speakers neatly hidden behind a shelf on which is placed the TV. 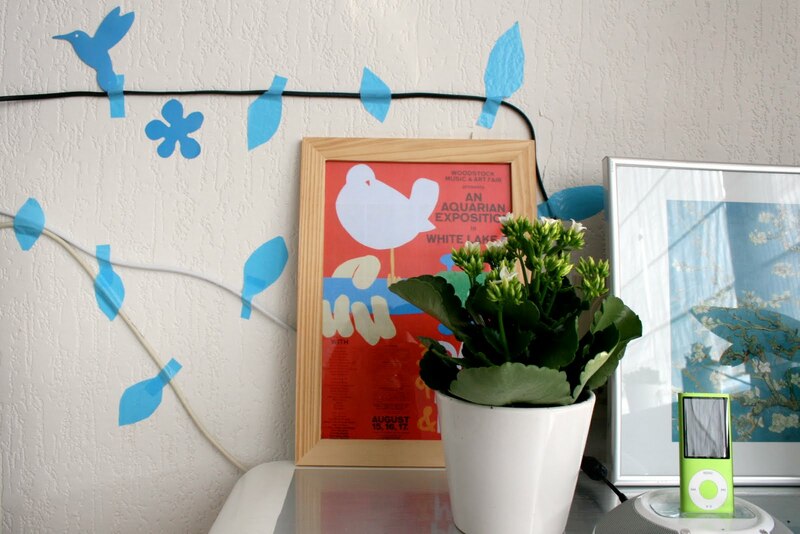 If the screen decided to hang on the wall – the wire hiding in the box matched the color of Wallpaper, and under it put a climbing plant, tendrils and twigs which allowed to curl in the box. 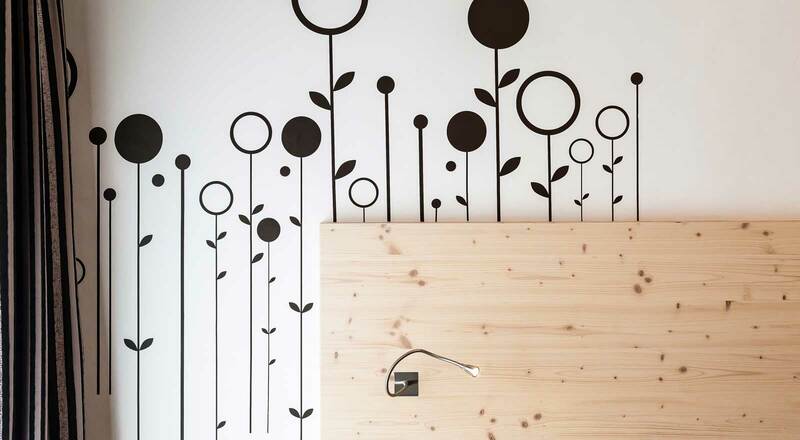 Many designers suggest not to hide the wires, and just decorate them with colored ribbons for the decoration of the apartment-style pop art, plants (best fit curly) – for eco-style, hollow wood boxes, wooden panels, if we are talking about classical interiors. 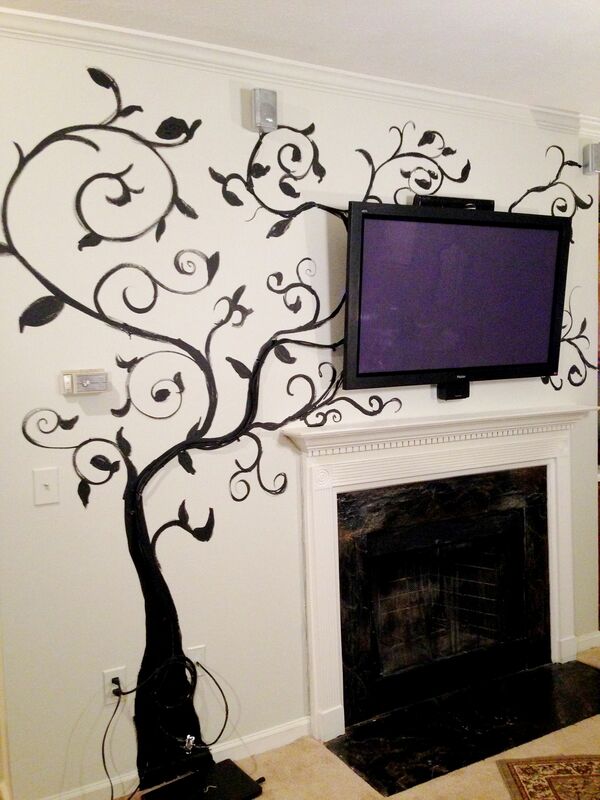 When you have to hang a bracket for a heavy TV, first choose a design to fit all the sockets. 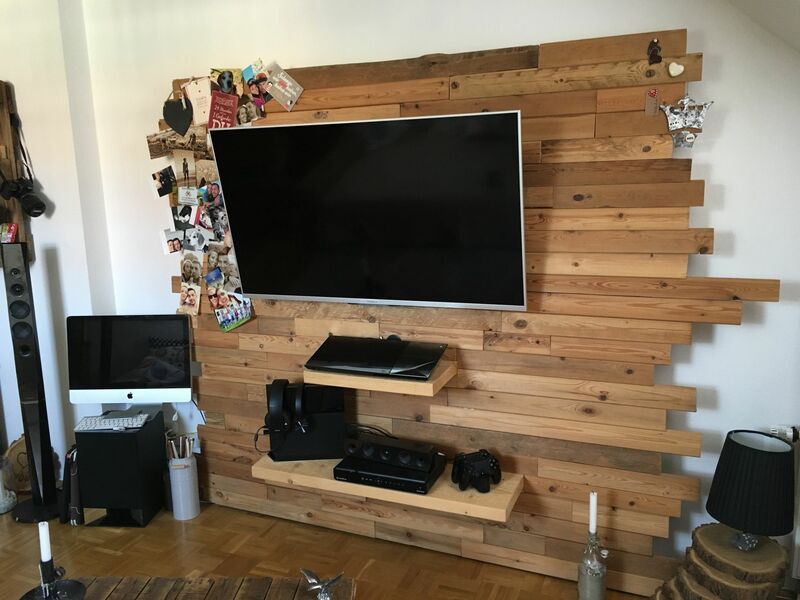 Sometimes on the wall where you will put the TV-screen, mount the box in which hide the cords from the speakers, DVD player, other electronics. In the home office that it looked neat, laces coming from the computer, the router also need to be removed. A paper clip will allow you to “let” string, which get in the way, under the surface of the table from the very edge. The clip is easy to fix on a wall, shelf, and from several of these parts get kind of delimiters for inputs of different charges. 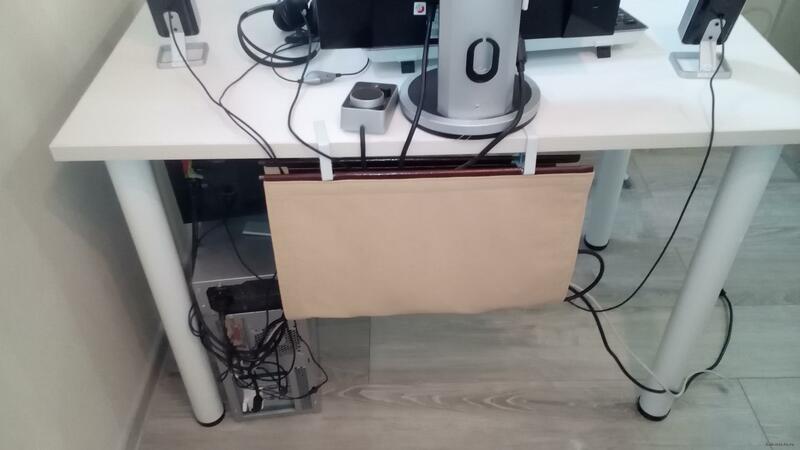 If possible, wires hanging in the back of a Desk, just curtain textile curtain. 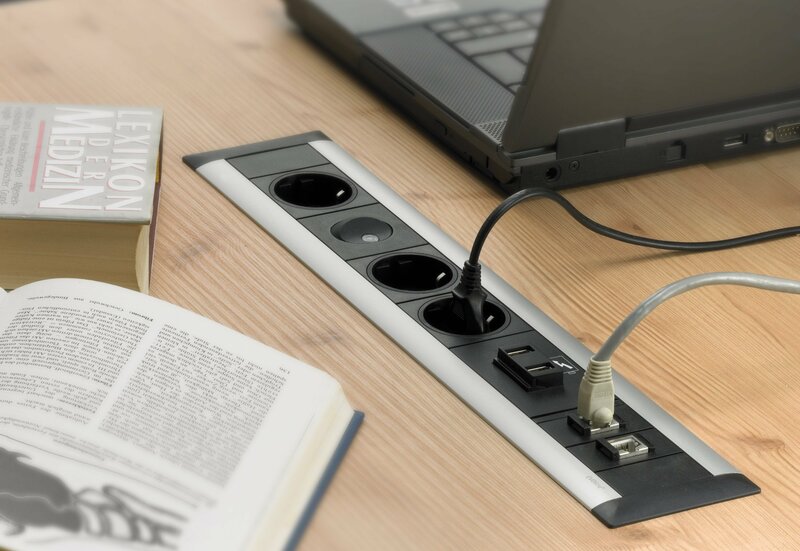 Some of them can be made into a mini-hammock there is easy to accommodate the “head” of the extension cable together with the charging devices, greatly hindering on the table. Some companies produce special wires separators – two or more cord neatly stacked inside a wooden, plastic, rubber or metal construction. 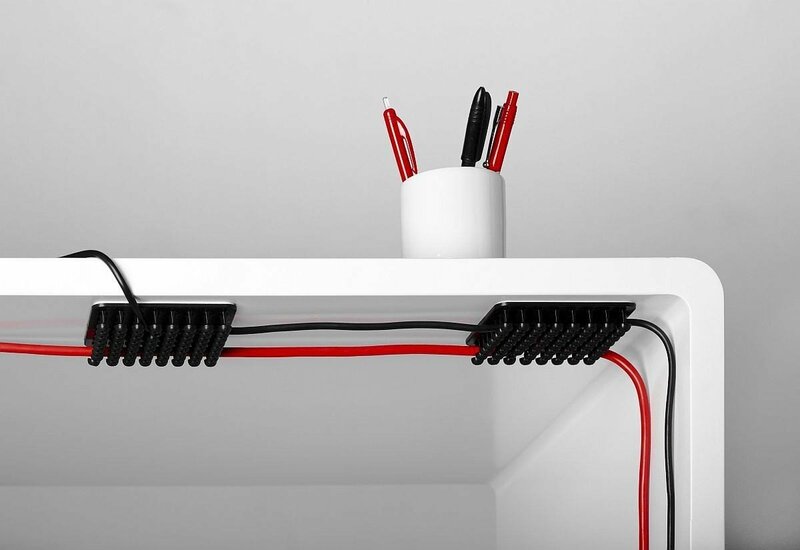 Cool store option to hold the wires, looks like two wire elektroniski. Fun look pockets made from plastic bottles, clothing pockets – the product is hung on a wall socket, turn on the charger, and the phone and a cord from it lay quietly in the pocket. 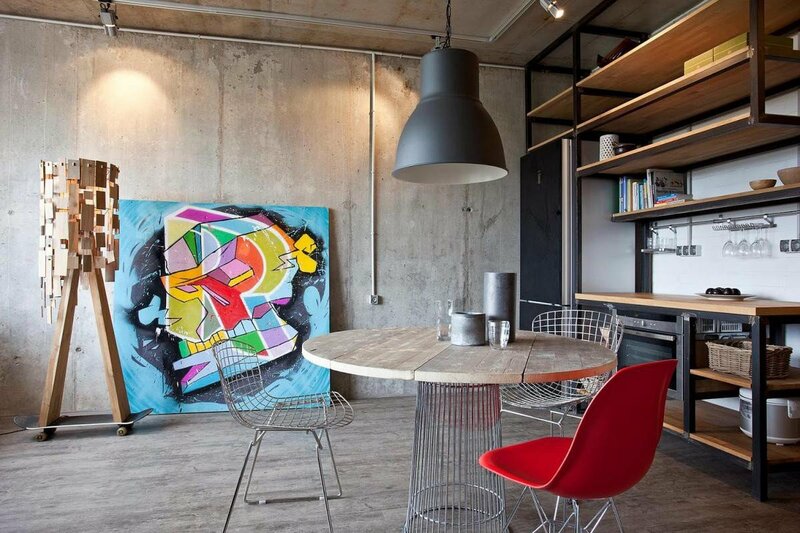 By simple modernization of the Desk with spacious drawers, all wiring neatly hides. 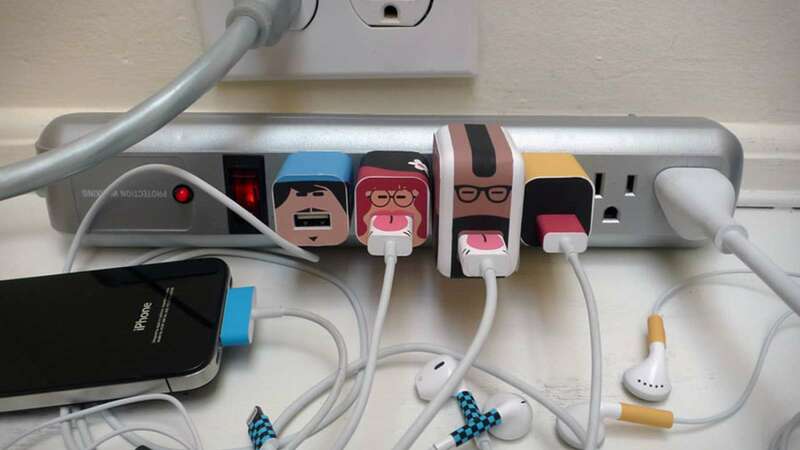 Modern people often need to charge multiple devices simultaneously. 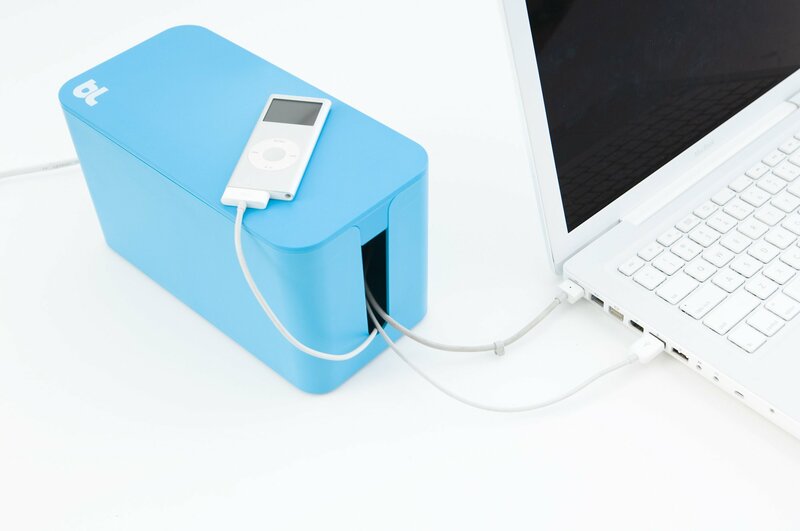 When they are all inserted into a “tee” or applied “mnogochlena” charging, with three to five cords for different devices, all items are collected one paper clip, attach to any nearby surface. Some of the purchase options constitute a box dividers, four or six curved openings which displays only the “tails” of the charges. Such a product is easy to accomplish with his own hands, by upgrading a simple Shoe box covered with fabric, wrapped with colored paper. Many companies producing goods for the house, make a whole series of protective elements designed to maximally protect the little man from electrocution. 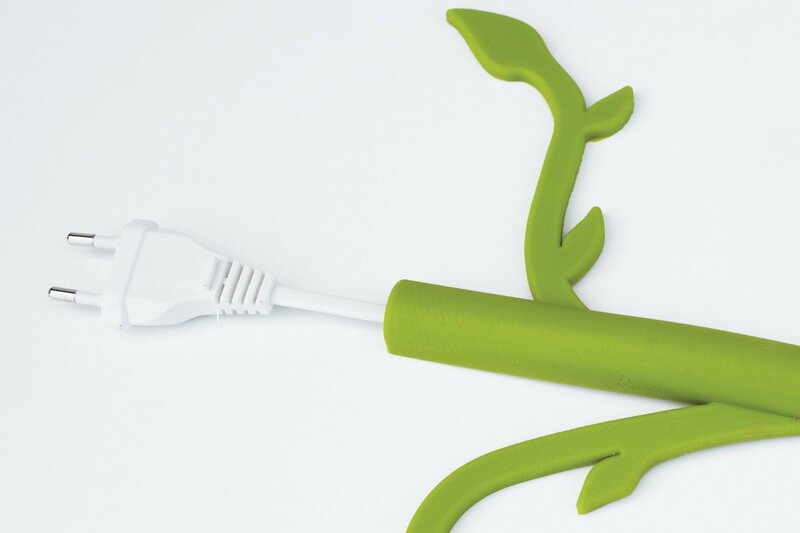 Companies such as IKEA, easy release clips for the wires – they are difficult to cut, smash, and inside will comfortably fit two or four cord. 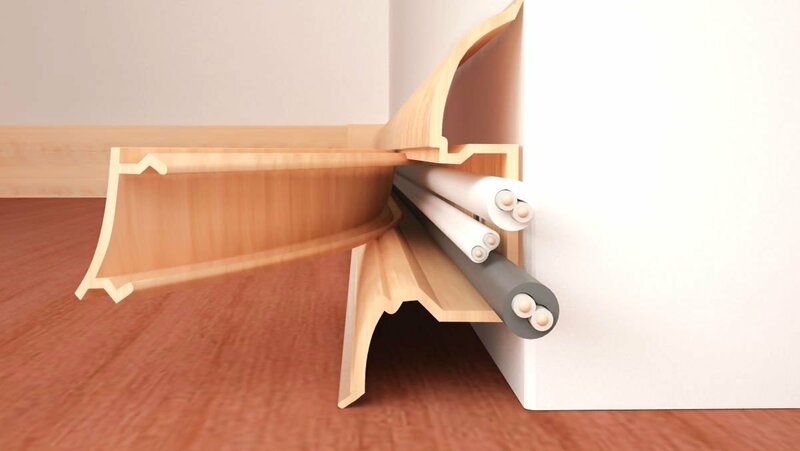 Special integrated design, allowing you to charge your phone or tablet, are embedded in any furniture surface – they are easy to place outside the reach of the child. 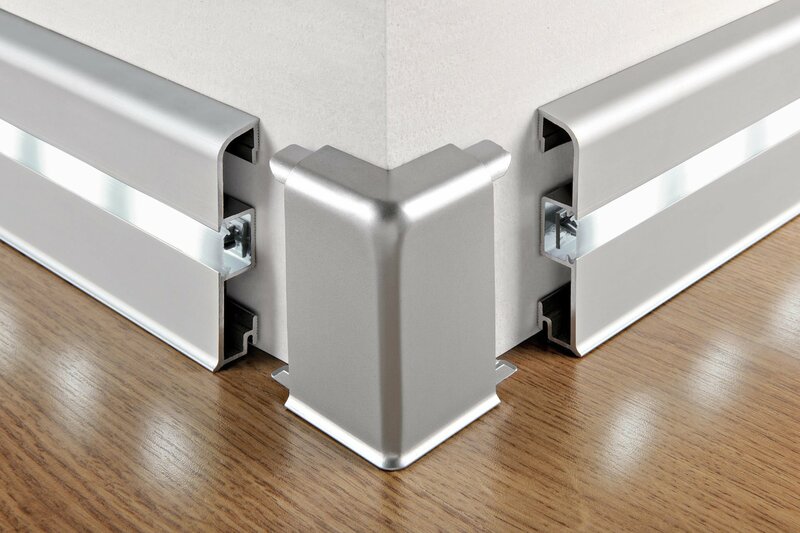 The same firm manufactures boxes, bags and covers for the buttons – they are hiding box extender, partially of electrical wire that allows you to give a tidy appearance for the entire room. For some devices there are completely wireless design – to charge them tablet, phone, player, simply to put a gadget on this charger. If the items protection for laces, cords could not be purchased, all “dangerous” items hidden in a large cardboard, plastic, wooden boxes, which are placed in areas inaccessible to the baby. Wireless technology is still not widespread – the vast majority of electrical appliances have to turn in the socket. 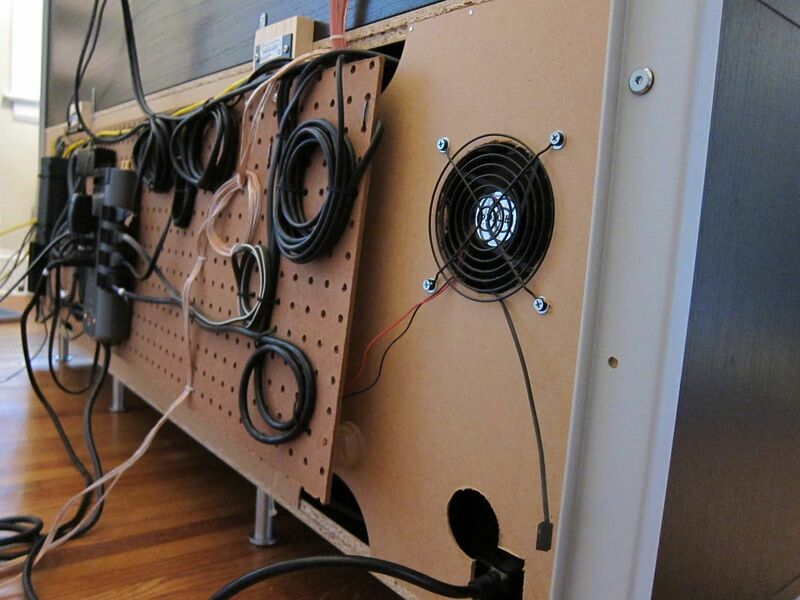 The output is the shelter of the cords in the cable channel in the wall or under the baseboard. 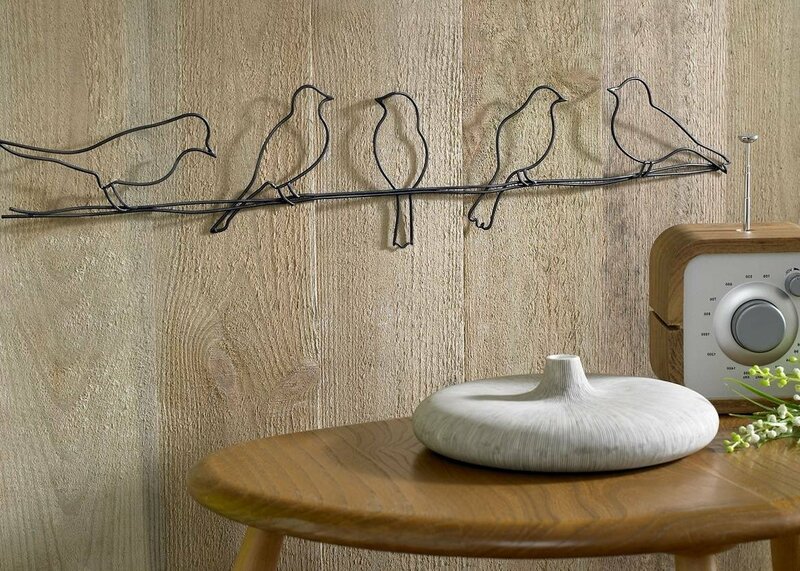 To make a long wire is a work of art, with original decorative elements, is also possible. 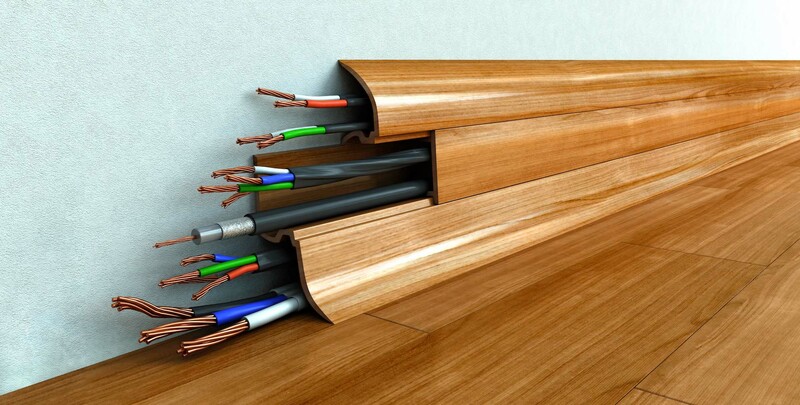 To efficiently disguise the cables and cords from all devices in the ceiling, the floor is usually to help specialists.